HowMechanismWorks ? : WHAT IS MANUFACTURING CAPABILITY ? 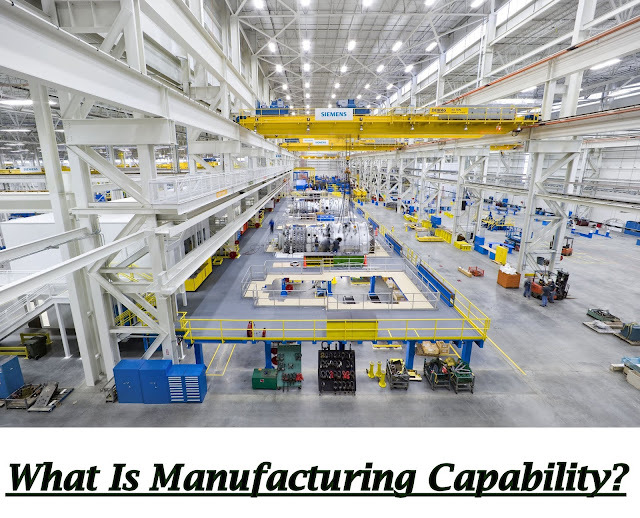 WHAT IS MANUFACTURING CAPABILITY ? Manufacturing capability refers to the technical and physical limitations of a manufacturing firm and each of its plants.A manufacturing plant consists of a set of processes and systems (and people, of course)designed to transform a certain limited range of materials into products of increased value. These three building blocks materials, processes, and systems constitute the subject of modern manufacturing. There is a strong interdependence among these factors. A company engaged in manufacturing cannot do everything. The technological processing capability of a plant (or company) is its available set of manufacturing processes. Certain plants perform machining operations, others roll steel billets into sheet stock, and others build automobiles. A machine shop cannot roll steel, and a rolling mill cannot build cars. The underlying feature that distinguishes these plants is the processes they can perform. Technological processing capability is closely related to material type. Certain manufacturing processes are suited to certain materials, whereas other processes are suited to other materials. By specializing in a certain process or group of processes, the plant is simultaneously specializing in certain material types. Technological processing capability includes not only the physical processes, but also the expertise possessed by plant personnel in these processing technologies. Companies must concentrate on the design and manufacture of products that are compatible with their technological processing capability. A second aspect of manufacturing capability is imposed by the physical product. A plant with a given set of processes is limited in terms of the size and weight of the products that can be accommodated. Large, heavy products are difficult to move. To move these products about, the plant must be equipped with cranes of the required load capacity. Smaller parts and products made in large quantities can be moved by conveyor or other means. The limitation on product size and weight extends to the physical capacity of the manufacturing equipment as well. Production machines come in different sizes. Larger machines must be used to process larger parts. The production and material handling equipment must be planned for products that lie within a certain size and weight range. A third limitation on a plant’s manufacturing capability is the production quantity that can be produced in a given time period (e.g., month or year). This quantity limitation is commonly called plant capacity, or production capacity, defined as the maximum rate of production that a plant can achieve under assumed operating conditions. The operating conditions refer to number of shifts per week, hours per shift, direct labor manning levels in the plant, and so on. These factors represent inputs to the manufacturing plant. Given these inputs, how much output can the factory produce? Plant capacity is usually measured in terms of output units, such as annual tons of steel produced by a steel mill, or number of cars produced by a final assembly plant. In these cases, the outputs are homogeneous. In cases in which the output units are not homogeneous, other factors may be more appropriate measures, such as available labor hours of productive capacity in a machine shop that produces a variety of parts. Materials, processes, and systems are the basic building blocks of manufacturing and the three broad subject areas of this book. This introductory chapter provides an overview of these three subjects before embarking on detailed coverage in the remaining chapters.